The Gloster E.28/39 was given the designation G.40. 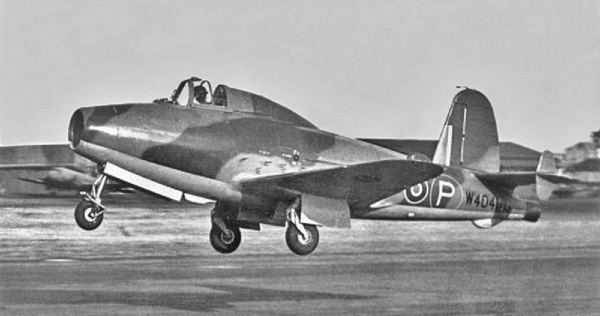 The Gloster E.28/39 wasn’t only just a ‘first’ for the Gloster Aircraft Company, it proved that jet propulsion worked. It was the first British jet aircraft to fly and was a single engine design and powered by a Whittle W.1 engine. It was considered to be experimental and only two prototypes were built. Although Frank Whittle of the United Kingdom and Hans von Ohain of Germany were simultaneously and independently working on the turbojet engine, Germany would be first in flight with jets with the introduction of the Heinkel He 178 on August 27, 1939. The next jet aircraft to take flight was the Gloster E.28/39 (G.40) on May 15, 1941. Both jets were powered by a single engine built for experimental purposes and not meant for production, although the E.28/39 design required provisions for possible later installment of armament. It was rare for a new plane to exceed design estimates, but that's exactly what happened. The second prototype did not fly until March 1943, but it was lost several months later due to a malfunction. Fortunately, the pilot bailed out and survived. As Power Jets improved its engine technology, a Whittle W.2B was installed in the E.28/39 and the aircraft achieved a top speed of 466 mph (750 km/h), making it faster than any contemporary fighter aircraft then in service. The sole surviving E.28/39 is in the Science Museum in London. John Golley. Genesis of the Jet. Frank Whittle and the Invention of the Jet Engine. Shrewsbury, England: Airlife Publishing, Ltd., 1997. 171.